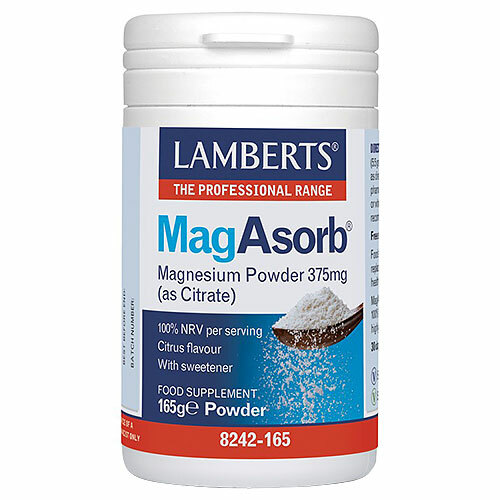 Each 5.5g scoop of LAMBERTS MagAsorb powder provides a full 100% NRV of magnesium, great-tasting and using only the highly bioavailable citrate form. Also includes free scooper! The effects of magnesium insufficiency are wide-ranging and can include the occurrence of muscle cramps, fatigue and many symptoms of premenstrual syndrome. This is all provided that the supplement contains a good level of the mineral and that it is in a form which the body can easily absorb and utilise – that’s where MagAsorb comes in. 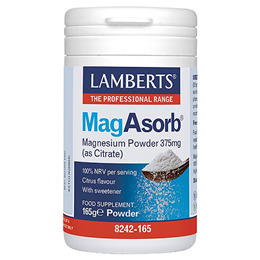 Additionally, in tests comparing MagAsorb with two other commonly used magnesium compounds, the absorption of MagAsorb in the body was far superior. Magnesium Citrate, Citric Acid, Dextrin, Acidity Regulator: Sodium Hydrogen Carbonate, Flavouring, Anti-caking Agents: TriCalcium Phosphate & Silicon Dioxide, Sweetener: Sucralose, Colour: Lutein. Mix 1 level scoop (5.5 grams) in cold water daily, or as directed by a practitioner or pharmacist. Below are reviews of LAMBERTS MagAsorb - 165g Powder by bodykind customers. If you have tried this product we'd love to hear what you think so please leave a review. Great tasting magnesium, tastes like orange. Each 5.5g scoop of MagAsorb powder provides a full 100% NRV of magnesium which is great-tasting and provides the highest bioavailable citrate form. Free scooper provided.